When we receive Jesus Christ, our Father God brings us into a relationship with Himself by the Holy Spirit, and He gives us names that describe our identity as those who have been born again into His family. These names ground us in an uncertain world. This Collection was designed to help you reflect on one of these names each month. 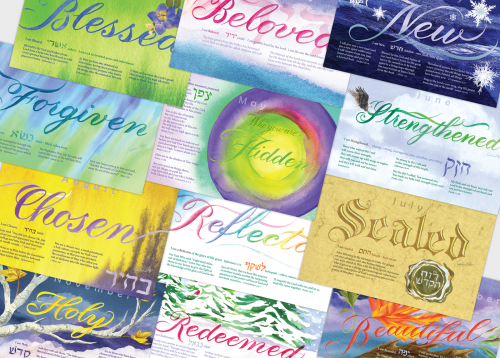 Loaded with encouragement, each Collection includes 12 art prints that can be displayed each month, memory verses, Hebrew watercolor words and their meanings, devotionals, and space inside to write personal reflections year after year. A devotional instruction sheet is also includedthat explains how to use these cards. You can view this sheet at the end of the image scroll. Also included are 12 envelopes if you choose to send the cards to others. As the artist, I like to use these cards as birthday cards, as well as for personal encouragement. Loaded with encouragement, each Collection includes 12 art prints that can be displayed each month, memory verses, Hebrew watercolor words and their meanings, devotionals, and space inside to write personal reflections year after year. A devotional instruction sheet is also includedthat explains how to use it these cards. You can view this sheet at the end of the image scroll. Also included are 12 envelopes if you choose to send the cards to others. As the artist, I like to use these cards as birthday cards, as well as for personal encouragement. This keepsake contains 12 vibrant art prints, memory verses, devotionals, and space to write personal reflections for years to come. Our Father has given us names that describe our identity as those who have been born again into His family. This gift was designed to help you reflect on one of these names each month. These are not names that describe us after we “have our act together,” but names that describe us now, because we are His. They remain constant even though the clouds of our feelings, weakness, fear, grief, and emotions may hide their reality. We have this hope as an anchor of our souls, a hope both sure and steadfast... (Hebrews 6:19).